Early last spring, John Kessler invited five undergraduate students and a master’s degree candidate on a research venture of the type usually conducted by advanced scientists. John Kessler’s principal interest is the dynamics of methane in oceans. He joined Rochester’s faculty in 2012 from Texas A&M University, where he had conducted headline-grabbing research on the aftereffects of the Deep Water Horizon oil spill in the Gulf of Mexico. The spill, he said, provided him “a natural laboratory” to answer some basic questions, such as, “What happens when a large release of methane is emitted to the ocean. Where does it go? What is its ultimate fate?” He discovered that within months of the spill, methane levels had returned to pre-disaster levels as rapidly reproducing microorganisms devoured more than 200,000 metric tons of the gas. The research he and his group of mostly undergraduates are conducting this year is an initial phase of what he hopes will be an extensive investigation. They’ll be measuring the concentrations of methane in each of the Great Lakes at varying points in space and time. That data, he says, will lead to some hypotheses to address larger unknowns about the source of the methane and the dynamics of its release and impacts. Widely recognized on the River Campus as an inspiring teacher, Kessler won the Goergen Award for Excellence in Undergraduate Teaching in 2015. An associate professor of earth and environmental sciences, Kessler introduced the students in his course Research in Biogeochemistry to some intriguing questions about methane. It’s long been known that methane is a potent greenhouse gas. It’s also generally accepted as fact among oceanographers and limnologists (the scientists who study inland waters) that freshwater bodies are significant natural sources of methane to the atmosphere. Yet, Kessler notes, there’s a paucity of data on the Great Lakes, collectively the largest liquid freshwater environment on the planet. The questions Kessler has are many, and the answers have implications for the global effort to understand climate change. 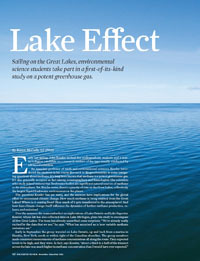 How much methane is being emitted from the Great Lakes? Where is it coming from? How much of it gets transferred to the atmosphere? And how does climate change itself influence the dynamics of further methane production, release, and emission? A much more efficient heat trapper than carbon dioxide, methane is widely considered the second most important greenhouse gas among those who study and combat global climate change. Its sources are both natural and human-derived, and it “accounts for a substantial fraction of the manmade warming in the atmosphere that we’re experiencing right now,” says John Kessler, associate professor of earth and environmental sciences. 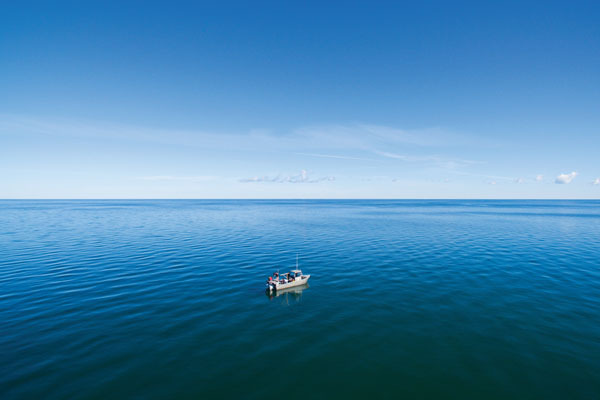 Why study methane in the Great Lakes? Oceans, which have been studied extensively, are relatively minor sources of methane in the atmosphere. Fresh water environments are significant sources, and, according to Kessler, there’s been surprisingly little research on them. The Great Lakes collectively form the largest body of fresh water on the planet—an estimated six quadrillion gallons. What do we want to know about methane? Although Kessler and his team are focused on methane, they won’t be considering it in isolation. The key to climate change is in the interaction of gases with one another, and the dynamics of that interaction are in constant flux. Certain processes add to the atmospheric concentration of greenhouse gases; other processes work to remove them. Many of those dynamics are not well understood. The course began last spring semester, as the students each developed individual research plans in which they would examine some aspect of methane cycling in the Great Lakes and nearby waterways. They prepared formal research proposals, outlining hypotheses and experiments as if they were applying for a National Science Foundation grant. At the end of the semester, the students conducted mock panel reviews. They developed a means of vacuum gas extraction in which water is pumped continuously through a gas-permeable membrane, while a vacuum removes dissolved gases from the water stream. The extracted gases are then pumped into a spectrometer where they can be analyzed in real time. They used that equipment, as well as traditional methods, to collect and analyze data. Over the summer, not everything went as they had hoped. The group had to cancel a few of their excursions. It was unusually hot and dry throughout July and August—except on many of the days Kessler planned trips. “I was joking that I could single-handedly end the drought in western New York just by scheduling more of our trips on Lake Ontario,” he quips, referring to the excessive rain and winds that befell the region on several of the days the students were to collect data. Nonetheless, their efforts paid off. They’d begun with a small budget: a $10,000 Pump Primer grant from Arts, Sciences & Engineering, and some additional monies from the Elizabeth Wright Dunbar fund, which supports the Department of Earth and Environmental Sciences. 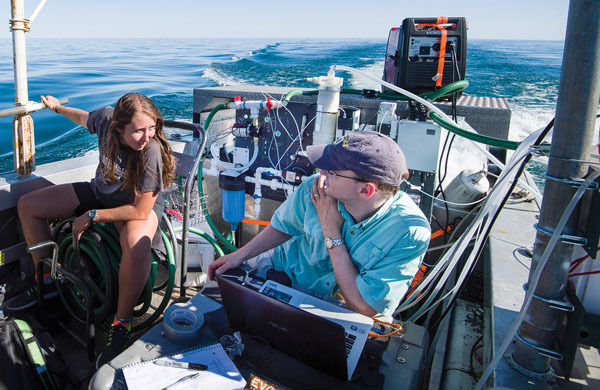 Based on the seed data the group collected last summer and the instrument prototypes they developed, the National Science Foundation awarded Kessler a two-year grant that enabled them to spend a week in October collecting data on Lake Superior in a state-of-the-art, fully staffed NSF research vessel. Nicola Wiseman ’18, an environmental science major from Waterford, Connecticut, says the voyage was galvanizing. “The crew of the ship was wonderful. We accomplished a lot in terms of data collection, so we’re all thrilled,” she says. The students divided into day and night shifts, taking surface methane samples every hour while their continuous gas extraction equipment ran without interruption. The fully equipped vessel made it possible for them to conduct some quick data analyses and prepare the data for a full analysis back in Kessler’s lab. Wiseman is looking forward to that process, as well as to continuing the research for the long haul. Eric Yarmoff ’17, an environmental science major who was born in Princeton, New Jersey, and raised in France, says the course is teaching him a great deal not only about science, but also about the life of a scientist conducting field research. Kessler revels in surprise and uncertainty, and delights in furthering a similar spirit of adventure among his students. For this group, that spirit seems to have come naturally. “The success of an endeavor like this largely hinges on the quality of the students,” he says. On Lake Superior, the group hit some rough weather—the kind that can knock scientists out for hours at a time.